Quilting Nelson’s Column – is there room for me to sew? Just over a year ago I visited the National Maritime Museum in London and saw what I thought was a quilt of Admiral Lord Nelson hanging in the Nelson, Navy, Nation exhibition. On closer inspection, the “quilt” turned out to be a banner celebrating Nelson’s victory at the Battle of the Nile (1798) made of cotton, linen and wool, with a red silk border, and Nelson’s likeness painted directly on to the fabric. According to the Museum’s online catalogue, the maker of the banner is unknown. The banner is one of many symbols of Nelson’s popularity at the end of the eighteenth and beginning of the nineteenth centuries. Despite growing scandal in his personal life (an affair with Emma, Lady Hamilton, and separation from his wife, Fanny) the Battle of the Nile confirmed Nelson’s place as a national hero. His likeness appeared on jugs, furnishing fabrics, tankards, plant pots, pill boxes – almost anything could be decorated with a Nelson motif and sold to anyone who wanted to express their admiration through their belongings. If you walk down the Strand from Somerset House to Whitehall today, you will pass through Trafalgar Square, where the best known monument to Nelson watches over London. Nelson’s Column is such an accepted part of the London landscape that it is easy to pass by without really looking at it. But if you stop and take a closer look, you will see four bronze panels at the base commemorating Nelson’s most celebrated victories – Cape St Vincent (1797), The Nile (1798), Copenhagen (1801), and Trafalgar (1805). Three of the four Nelson’s Column Quilt panels in progress – I made one for each of Nelson’s major victories. The panels – designed by four different artists – are made from bronze that was melted down from captured French guns. John Edward Carew’s Death of Nelson at Trafalgar was installed in 1849, The Battle of the Nile by William F Woodington in 1850, John Ternouth’s Battle of Copenhagen in 1850, and, finally, Musgrave Watson’s Battle of Cape St Vincent in 1854. Watson, who died in 1847 did not see his work in a finished form: the installation of the Cape St Vincent panel was delayed when it was found that the company charged with making it had cut the bronze with iron. Those responsible were charged with fraud and imprisoned; and the panel had to be recast. High above the bronze panels stands Nelson himself, sculpted by Edward Hodges Baily RA. Although his statue is 18 feet and one inch tall, it is not possible to see much detail from the ground. However, we know that Nelson in dress uniform is far above us, reminding us that we are an island nation. Having spent over a year studying Nelson’s face when working on my Nelson Quilt, I was curious to know what the face at the top of Nelson’s Column looked like. I spent hours hunting down and studying close up photographs of the statue and ended up with a much better sense of the detail. 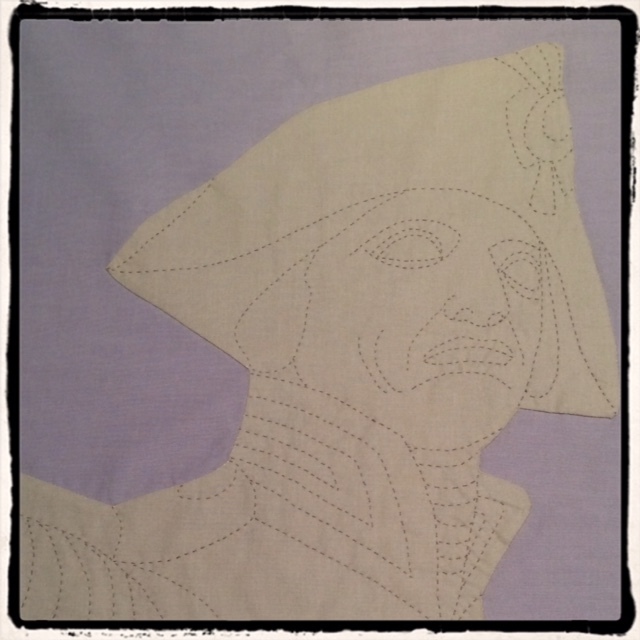 And then I pulled the Hero of the Nile banner concept and the detail of Nelson’s Column together into one quilt project. I wanted to recreate the banner’s use of Nelson’s face and combine it with the four victories of Nelson’s Column; after all, unlike the unknown banner maker who was sewing in 1798, I know what happened after the Battle of the Nile. The resulting Nelson’s Column Quilt is a quilt of contradictions. It is a modern looking piece that features a deliberately repeated design but it has been made using old fashioned hand sewing techniques (needle turn applique, hand quilting, and a traditional rope design for the border). As with the face at the top of Nelson’s Column, at a distance, you see a deceptively outline-only shade of Nelson; close up, you see the detail. I love the contradictions of this quilt – and I love what I learned when I was making it. Its stunning, all the hand quilting! While in Copenhagen just before Christmas discovered the British stole the danish navy fleet – now I know it was Nelson! Yes – he disobeyed orders and won the battle. It is where the phrase “turning a blind eye” comes from; Nelson put his telescope to his blind eye so that he would not be able to see the signal telling him to retreat.